This sinister looking craft might resemble Darth Vader’s imperial shuttle in Star Wars but it is actually a high-speed boat that uses its clever design to reduce the risk of seasickness. The vessel, called Ghost, uses two 12ft (3.6 metre) winged struts that stand on twin hulls to lift the main craft clear out of the water. This allows the Ghost to reach speeds of 33 knots (38 mph/61km/h) even when faced with waves of 8ft (2.4 metre) high. 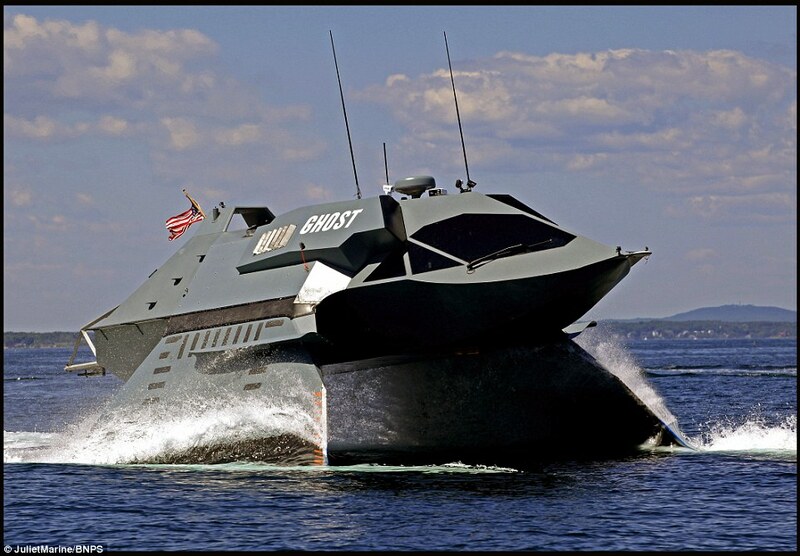 Ghost was developed by US-based Juliet Marine Systems, founded by entrepeneur Greg Sancoff. 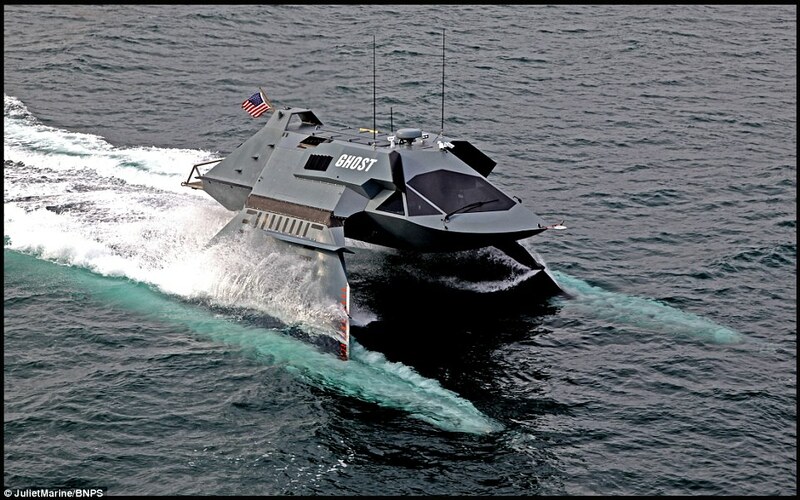 ‘Ghost is a reconfigurable high-speed small waterplane area twin hull (SWATH) vessel that delivers significant advantages over alternative vessels in this size class,’ according to the company’s website. It uses a supercavitation effect to reduce the ship’s drag coefficient by a factor of 900. The 38-foot (11.5m) long main cabin rests on top of a pair of 12-foot (3.6m) tall struts which, when moving at speed, prop the cabin above the water like a hydrofoil. The struts swivel at their base, allowing them to be raised and lowered depending on the water depth. While parked, or traveling through shallow waters, they can be extended to the side. In deeper waters, at speeds of eight knots or higher, they can rotate downward to lift the hull into the air, eliminating the jarring impact of waves. They’re sharpened along the leading edge as well to slice through submerged debris. At the other end of each strut, a 62-foot (18.8m) long tube houses a 2,000HP gas turbine engine spinning two front-mounted propellers. These tubes also eject a pocket of air from the front to generate a supercavitation effect that reduces the ship’s drag coefficient by a factor of 900. 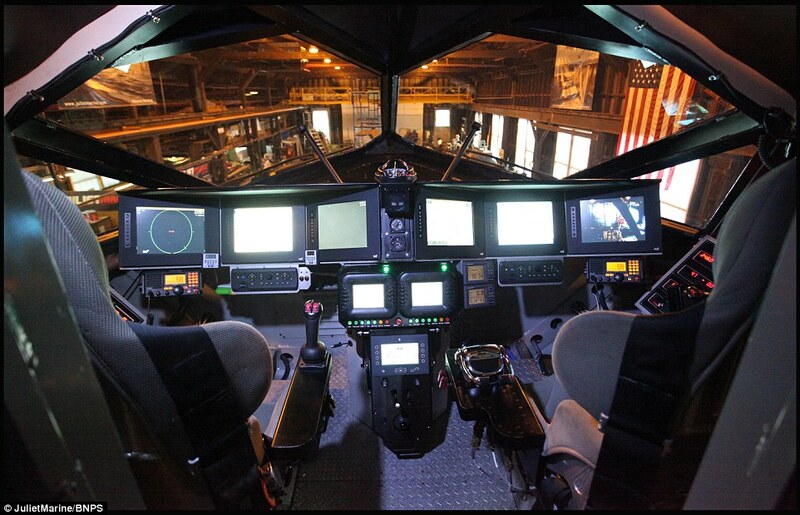 ‘It’s a revolutionary program,’ said Greg Sancoff, founder and CEO of Juliet Marine Systems. 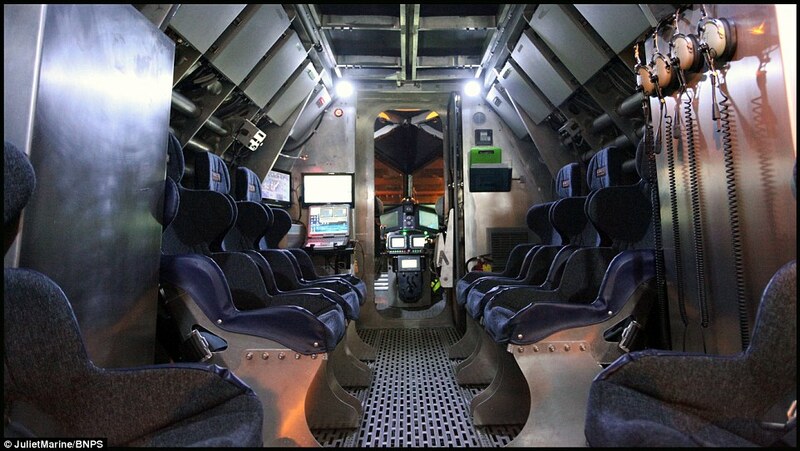 The Ghost rides on 12-foot (3.6m) struts connected to engine assemblies Sancoff says take advantage of ‘supercavitation,’ traveling underwater inside a bubble of gas. It is a new application of technology that the inventor insists will make Ghost fast. It has so far hit about 38mph (61km/h) but its creator believes it could approach 60mph (97 km/h), while staying stable even in rough seas. It was announced in December last year that the company will be working with Karmel Technologies, Inc. to bring the Ghost technology to Korea. One of these ships would set you back about $10 million (£6.9 million) according to the company website. 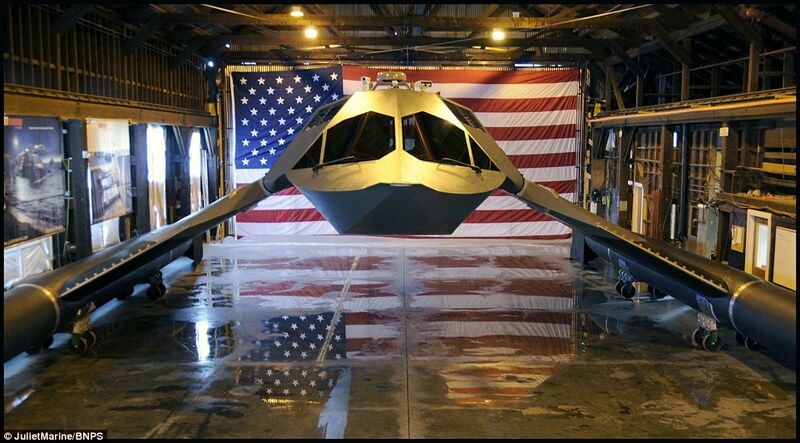 ‘A squadron of ten stealth Ghosts, carrying torpedos, missiles or cannons, would wreak havoc on any enemy,’ it says. Business Insider named the vessel one of the top 19 most game-changing weapons of the 21st century at the end of last year. 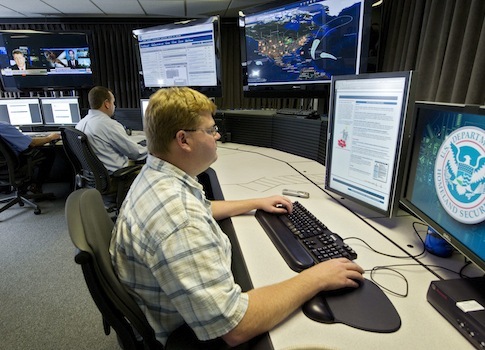 The United States will continue to suffer increasingly damaging cyber attacks against both government and private sector networks as long as there is no significant response, according to a recent U.S. intelligence community assessment. Disclosure of the intelligence assessment, an analytical consensus of 16 U.S. spy agencies, comes as the Obama administration is debating how to respond to a major cyber attack against the Office of Personnel Management. Sensitive records on 22.1 million federal workers, including millions cleared for access to secrets, were stolen by hackers linked to China’s government. U.S. officials familiar with the classified cyber assessment discussed its central conclusion but did not provide details. Spokesmen for the White House and office of the director of national intelligence declined to comment. Recent comments by President Obama and senior military and security officials, however, reflect the intelligence assessment. Obama said during a summit in Germany June 8 that he would not disclose who conducted the OPM hack. But he said such attacks would continue. “We have known for a long time that there are significant vulnerabilities and that these vulnerabilities are gonna accelerate as time goes by, both in systems within government and within the private sector,” the president said. Last week, Adm. Mike Rogers, commander of the U.S. Cyber Command, said the increase in state-sponsored cyber attacks is partly the result of a perception that “there’s not a significant price to pay” for such attacks. Privately, administration officials said the assessment appears to be an indirect criticism of the administration’s approach to cyber attacks that has emphasized diplomatic and law enforcement measures instead of counter-cyber attacks. Intelligence and cyber security experts agreed with the assessment that weak U.S. responses are encouraging more cyber attacks. “Until we redefine warfare in the age of information, we will continue to be viciously and dangerously attacked with no consequences for those attackers,” said retired Army Lt. Gen. Mike Flynn, a former Defense Intelligence Agency director. James Lewis, a cyber security expert at the Center for Strategic and International Studies, agreed. Lewis said the defensive approach that emphasizes closing vulnerabilities to cyber attacks is not working. “Unless we punch back, we will continue to get hit,” Lewis said. Lewis says that conducting retaliatory cyber strikes without starting a war is difficult but not impossible. “We’re all coming to the same place – that a defensive orientation doesn’t work,” he added. Rogers, the Cyber Command chief who has stated in the past that he favors more aggressive U.S. responses, acknowledged that the U.S. response to the OPM hack has been muted compared to the government’s highly-public response to North Korea’s damaging cyber attack in November against Sony Pictures Entertainment. The Sony hack was a failed bid by the North Koreans to derail the release of a comedy film critical of dictator Kim Jong Un. Major incidents in recent months include the Sony attack; cyber attacks against the health care provider Anthem that compromised the records of some 80 million people; attacks against State Department and White House networks from suspected Russian government-linked hackers; the OPM hacking; and an Iranian-backed cyber attack against the Sands casino in Las Vegas. Asked about the increase in state-sponsored attacks, Rogers said during a security conference in Colorado that one factor has been a lack of response. Rogers earlier in congressional testimony has suggested a more muscular cyber policy that would include demonstrations and threats of retaliatory cyber attacks against hackers in a bid to create deterrence similar to the Cold War-era strategic nuclear deterrence. In addition to more capable hackers, “you’ve got a perception, I believe, that to date there is little price to pay for engaging in some pretty aggressive behaviors,” Rogers aid. Nation states are only one part of the threat. Criminal groups also are conducting large-scale cyber attacks, Rogers said. In November, Rogers said he argued for going public in naming North Korea’s communist regime for the Sony hack and having the president make a public statement that Pyongyang would pay a price. Rogers said some officials in the administration favored a less public response to the Sony case. Rogers said he argued strongly that “we cannot pretend that this did not happen,” and that the attack had to be linked to North Korea directly. “My concern was if we do nothing, then one of the potential unintended consequences of this could be does this send a signal to other nation states, other groups, other actors that this kind of behavior [is okay] and that you can do this without generating any kind of response,” Rogers said. On not naming the Chinese for the OPM hack, Rogers appears to have lost out during the administration’s debate on naming the Chinese. “OPM is an ongoing issue,” Rogers said, adding that he would not discuss the specifics of internal discussions. Asked if he agreed with doing nothing about the OPM response, Rogers suggested some action might be forthcoming. He defended the more public U.S. response to the Sony hack that included limited sanctions against North Korean agencies and officials, by noting that to date no similar cyber attacks by Pyongyang have been conducted. The use of 3D printers has the potential to revolutionize the way food is manufactured within the next 10 to 20 years, experts from the Institute of Food Technologists (IFT) are claiming. According to a July 12th symposium at IFT15: Where Science Feeds Innovation hosted by the Institute of Food Technologists (IFT) in Chicago, advances in 3D printed technology will radically change the way food is produced, impacting everything from how military personnel get food on the battlefield to how long it takes to get a meal from the computer to your table. “The price of 3D printers has been steadily declining, from more than USD 500,000 in the 1980s to less than USD 1,000 today for a personal-sized device, making them increasingly available to consumers and manufacturers,” researchers said. “No matter what field you are in, this technology will worm its way in,” said Hod Lipson, a professor of engineering at Columbia University and co-author of the book Fabricated: The New World of 3D Printing. “The technology is getting faster, cheaper and better by the minute. Food printing could be the killer app for 3D printing,” said Lipson. For example, Lipson said, users could choose from a large online database of recipes, put a cartridge with the ingredients into their 3D printer at home, and it would create the dish just for that person. The user could customise it to include extra nutrients or replace one ingredient with another. Anshul Dubey, research and development senior manager at PepsiCo, said 3D printing already is having an impact within the company, even though it is not yet being used to make food. For example, consumer focus groups were shown 3D-printed plastic prototypes of different shaped and colored potato chips. He said using a prototype such as that, instead of just a picture, elicits a more accurate response from the focus group participants. The US military is just beginning to research similar uses for 3D food printing, but it would be used on the battlefield instead of in the kitchen, said Mary Scerra, food technologist at the US Army Natick Soldier Research, Development and Engineering Centre (NSRDEC) in Massachusetts. She said that by 2025 or 2030, the military envisions using 3D printing to customise meals for soldiers that taste good, are nutrient-dense, and could be tailored to a soldier’s particular needs. “Imagine warfighters in remote areas – one has muscle fatigue, one has been awake for a long period without rest, one lacks calories, one needs electrolytes, and one just wants a pizza,” Scerra said. “Wouldn’t it be interesting if they could just print and eat?” Scerra said. She noted that there are still several hurdles to overcome, such as the cost of bringing the technology to remote areas, the logistics of making it work in those locations and, perhaps most importantly, making sure the food tastes good. After a decade-long journey through our solar system, New Horizons made its closest approach to Pluto Tuesday, about 7,750 miles above the surface – roughly the same distance from New York to Mumbai, India – making it the first-ever space mission to explore a world so far from Earth. 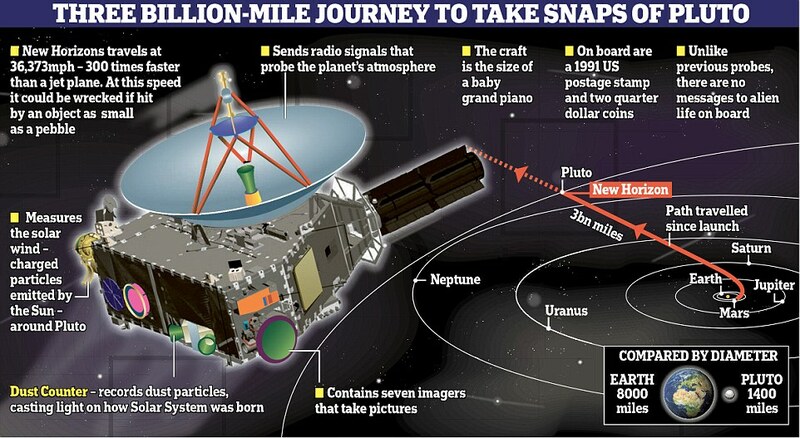 New Horizons’ almost 10-year, three-billion-mile journey to closest approach at Pluto took about one minute less than predicted when the craft was launched in January 2006. 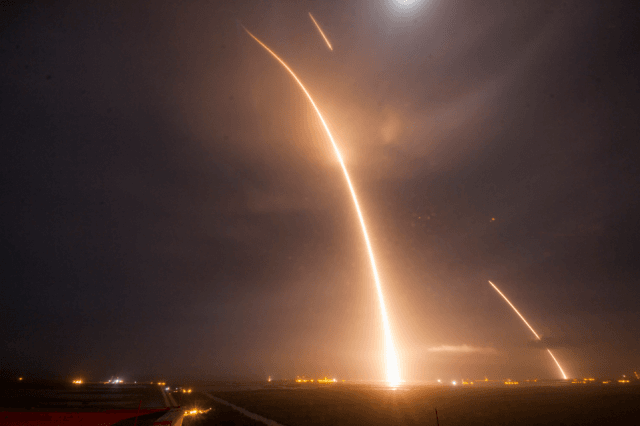 The spacecraft threaded the needle through a 36-by-57 mile (60 by 90 kilometers) window in space – the equivalent of a commercial airliner arriving no more off target than the width of a tennis ball. 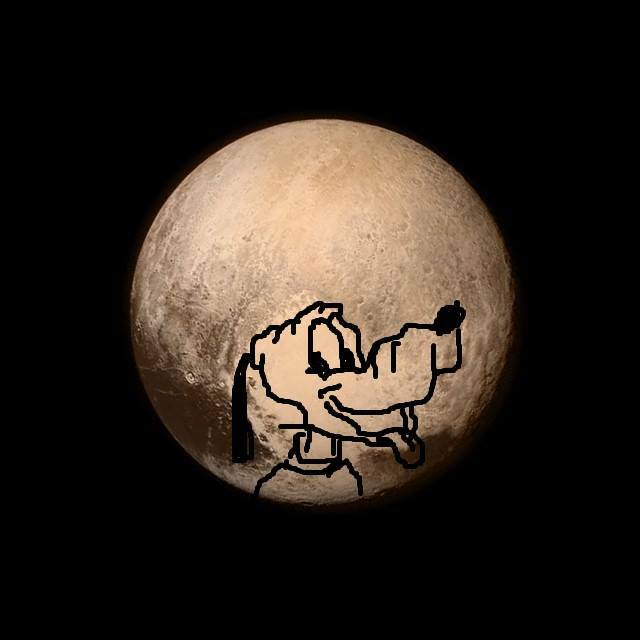 Because New Horizons is the fastest spacecraft ever launched – hurtling through the Pluto system at more than 30,000 mph, a collision with a particle as small as a grain of rice could incapacitate the spacecraft. Once it reestablishes contact Tuesday night, it will take 16 months for New Horizons to send its cache of data – 10 years’ worth – back to Earth. For more information on the New Horizons mission, including fact sheets, schedules, video and images, visit www.nasa.gov/newhorizons. Mashable reports that the premises looks like a mashup of the Enterprise-E, Enterprise-D, and the starship design from the J.J. Abrams reboot movies, but die hard Star Trek fans disagree – they say it looks more like the Voyager. As smashing as its exteriors are, we’re not sure if the NetDragon office mimics the Enterprise’s cool interiors as well. Some reports suggest that it has a few awesome features inside, like automatic sliding gates, 30-foot slides connecting the third floor to the first, and a giant T-Rex replica. Liu, whose $600 million fortune is larger than the Queen of England’s, is fondly called ‘big child’ by the Chinese media. The man is famous for indulging his employees and filling his offices with fun gadgets like pinball machines, batman toys, and segways. His obsession with Star Trek began when he was a student at the University of Kansas. So he reportedly obtained a special license from CBS, allowing him to build a replica of the spaceship. Star Trek fans, if you aren’t able to make it to China, you can get a clear view of the office on Google Maps!